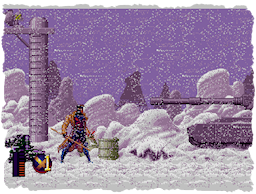 In early 1995, Sega published their second exclusive X-Men game for the Sega Genesis. 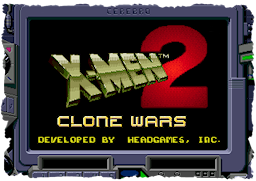 X-Men 2: Clone Wars, it was called, and it was received fairly well - best out of all 16-bit X-Men games that had come out thus far, in fact. Just like its predecessor, the game was a very simple, arcade-style action platformer that was perhaps gratuitously faithful to the diversity of the source material, when it came to having several characters that genuinely differed from each other in gameplay. However, absolutely everything else about the game apart from the solid cast was incomplete, and X-Men 2 ended up an even less memorable game than its predecessor in my books. Not total dung, but nothing to celebrate about either. Non-surprisingly, the biggest fault here is boring and repetitive level design. The playable characters' simple lack of aptitude follows up as a good number two. The tech-organic alien species known as the Phalanx has returned for another attempt at conquering Earth by manipulating their very own mutant forces. Several mutants have been captured and cloned for an army. Beast, Psylocke, Gambit, Nightcrawler, Cyclops and Wolverine, all of whom have thus far managed to evade capture, join forces with the unlikeliest of allies - Magneto himself - to drive them aliens back to the verges where they came from. Let me start off by stating the obvious: I've played a lot of X-Men games lately, and even more games based on Marvel Comics. Genesis games in particular demand high concentration on details from me, and a lot of background research, 'cause almost every game I play on the Genesis nowadays besides some best-selling classics such as Sonic the Hedgehog and the earliest Genesis titles is a completely new experience to me. Might even be a whole new acquaintance. I was a Nintendo kid, and I didn't even know what was going on in the other 16-bit camp until my favourite magazine finally gave up to popular demand and started doing stuff on something else besides Nintendo back in 1995. Most of the games I've played thus far have been games I'll never even think to return to again; just some odd Spider-Man games here and there. The X-Men franchise in particular has been a huge disappointment for me, 'cause it's got so much potential and without exceptions, the potential has been laid to waste as the developers have truly invested in some odd element of the game that will surely please a lot of people, but they've forgotten everything else that would please a whole lot of more people. So, I was doing background research on X-Men 2: Clone Wars before putting it to the grand test. Based on a pitiful total of two reviews, the game stands at a sharp 70 on GameRankings; that really isn't too bad by the usual retro standard of GameRankings. The game held fairly good averages on both MobyGames and GameFAQs, and the general "reception" part on Wikipedia told me that the game has even been called one of the greatest Genesis games ever made. Of course I was psyched up; every bit of prejudice I might've had, dropped out one by one at each word I read. I poured myself a long, cold drink, and was fully prepared to finally break this franchise, and this whole marathon, above the usual crappy average. Now, as I said, I've played a lot of bad games during the last year, but you could say that after all that hype, X-Men 2: Clone Wars is one of the biggest disappointments I've had to deal with. It's superficially fancy, it has a good cast of characters (on paper) and a good story that will surely pique the curiosity of comic book fans, but that's where the fun ends - when we start going into the practical things, such as gameplay and level design. I'm hoping this pattern will break sooner rather than later, but it certainly does not happen here, and I sincerely do not see what's so great about this game, or even essentially new compared to its predecessor. To me, it's the same old, in a slightly more beautiful wrapping. Maybe that's what mattered. Don't know. The level and enemy design take the usual easy ways out, but in turn, the playable characters are extremely well detailed. The environmental effects such as the initially prominent snowfall are quite neat, as well. The music is of the typical, unimaginative and repetitive fare, not much to say about it. The game plays out almost exactly like the previous Genesis title, only there are more playable characters and their abilities are a whole lot more diverse, to the point that some of them are sure winners, while some are completely useless. For example, Cyclops and Gambit are excellent characters to use due to their ranged attacks, and not only is Nightcrawler faster than everyone else, he can climb walls - once again, his teleportation ability doesn't have much sensical use at all, it's used for a strange sort of offense rather than actual teleportation. Sadly, my favourite X-Men - Wolverine and Beast - get the short end of the stick here. Beast's special move is a slow and heavy ground pound attack that has no use at all against the fast and well-ranged enemies, and the range of Wolverine's attacks is pathetic. This leaves Psylocke, who I've always perceived as an oddball character, perhaps due to her absence from the X-Men media most familiar to me. The even initially uninteresting levels are extremely lengthy and your life bar extremely small. Even Wolverine's regeneration ability works up to three ticks of health. 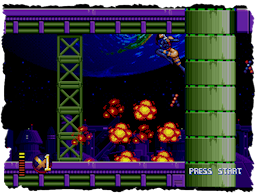 Enemies can pop up from the purest blue even in what's supposed to be a "tutorial level"; the title screen doesn't even show until you've finished the first level, and even accomplishing that much might seem impossible at first. There are no checkpoints, and no save system of any kind. There's no solid reason for me to blurt out my honest opinion, you can pretty much imagine it.